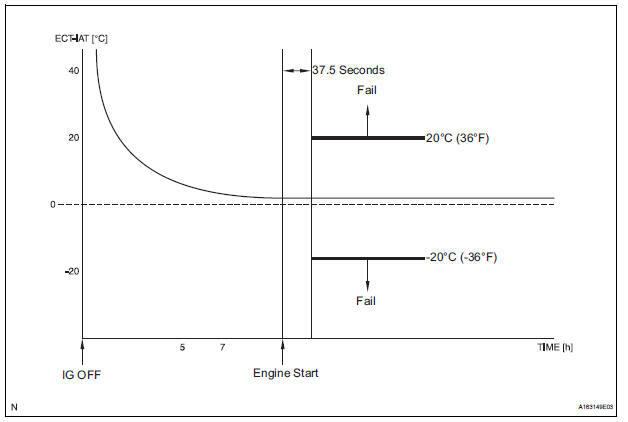 The ECM calculates the difference between the readings of the coolant temperature sensor and intake air temperature sensor. If the difference is greater than 20°C (68°F), the ECM will judge this as a malfunction and will set this DTC. Waiting is required to prevent the temperature of the engine from affecting the readings. If the engine has been operated recently, it will not be possible to accurately compare the readings. For diagnosis, in order to duplicate the detection conditions of the DTC, it is necessary to park the vehicle for 7 hours. Parking the vehicle for 7 hours ensures that the actual temperature of the ECT and IAT are very similar. When the vehicle has been parked for less than 7 hours, differences in the readings may exist, this does not necessarily indicate a fault. (c) Turn the tester on. (d) Enter the following menus: DIAGNOSIS / ENHANCED OBD ll / DTC INFO / CURRENT CODES. If any DTCs other than P011B are output, troubleshoot those DTCs first. (a) Leave the vehicle for 7 hours or more. It is necessary leave the vehicle for 7 hours or more to allow conditions similar to the DTC detection conditions. (b) Connect the intelligent tester to the DLC3. (c) Turn the ignition switch to the ON position. (d) Turn the tester ON. (e) Enter the following menus: DIAGNOSIS / ENHANCED OBD ll / DATA LIST / PRIMARY / INTAKE AIR. (f) Read the value displayed on the tester. OK: The intake air temperature and the outside air temperature are within 10°C (50°F) of each other. Temperature readings on the vehicle's outside temperature gauge (if equipped) are not suitable for comparing to the IAT reading. The outside temperature gauge has a significant delay built in to prevent temperature swings from being displayed on its display. Use an accurate thermometer to determine the outside air temperature. (d) Enter the following menus: DIAGNOSIS / ENHANCED OBD ll / DATA LIST / PRIMARY / COOLANT TEMP. OK: The coolant temperature and the outside air temperature are within 10°C (50°F) of each other. If the result is not as specified, check that there are heat sources such as a block heater in the engine compartment. Throttle / Pedal Position Sensor / Switch "A"